Beloved Aurora University professor emeritus Joe Dunham, 80, passed away peacefully in his sleep on Saturday, April 13, 2019. Born March 17, 1939, Dunham was born and raised in Missouri. He attended Southwest Baptist College, Oklahoma Baptist University, Oklahoma University, and Northwestern University. Dunham began his career at Aurora College in 1964, instantly standing out as a remarkable teacher of philosophy and religion. Students throughout the decades created lifelong memories and learned valuable lessons through his courses and numerous books. In 2006, he retired from the classroom but became a Senior Fellow in the university’s Wackerlin Center for Faith and Action. In recognition of his work, Aurora University awarded Dunham an honorary Doctorate of Humane Letters degree in 2007. He received numerous other accolades from AU, including two Marcus and Mark H. Trumbo Awards for Excellence in Teaching, the Spirit Award, Academic Advisor of the Year, and the Meritorious Faculty Award. He was also Kingfisher Fellow of Philosophy of Religion at the University of Oklahoma and a member of the American Philosophical Association, the Illinois Philosophical Association, the Association for the Development of Philosophy Teaching, the Aurora Clergy Association, Omicron Delta Kappa, and the United Way of Aurora. Dunham is survived by his wife Ida (Muskrat) Dunham of Aurora, his children Melanie (Mark) Greenberg of Naperville, Illinois, Elizabeth (Gary) Slotnick of Champaign, Illinois, Phillip (Melissa Angio) Dunham of Chicago, Richard (Mika Ogiwara) Dunham of Schaumburg, Illinois, daughter-in-law Elizabeth Ang of Chicago, and his sister Nancy (Jim) Shankle of Oxford, Missouri. He is also survived by eight grandchildren and numerous cousins, nieces, nephews, and friends. 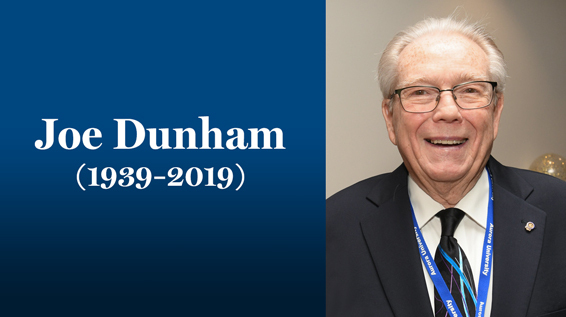 Aurora University will host a celebration of Dunham’s life on Wednesday, April 24, at 11 a.m. in the University Banquet Hall (1410 Marseillaise Place, Aurora, Illinois). Visitation will be held Monday, April 22, from 2 until 8 p.m. at New England Congregational Church, 406 West Galena Boulevard, Aurora, Illinois. The church will also hold a funeral service on Tuesday, April 23, at 11 a.m. In lieu of flowers, the family asks that donations be made to Aurora University or New England Congregational Church.